What makes the Scandinavian design so popular in homes all over the world is its minimalistic, clean and sleek look. When it comes to designing the place where all the family gets together for dinner, this style offers unique warmth, brightness and comfort making the dining rooms one of the favourite rooms to spend time in. As the dining room is a place that ought to offer functionality first, there are several things to consider so you can incorporate this design successfully. First of all, brightness. Scandinavian dining rooms are very bright, white and simple and with the long winters and moderate temperatures during summer, this design offers a homey warm feeling all year round. White walls reflect a lot of light, thus making it possible to take full advantage of the natural daylight. This gives the illusion of a larger and wider space. Also, white or light grey tiles can also seamlessly add the Scandi touch. In order for achieving a more sophisticated look, white grout with white tiles is the preferred choice. For a bolder stand-out feature though, you can consider dark grout as it will create achieve contrast. In order to add some colour in the middle of all the whiteness, it is best to add various pieces of wood furniture. 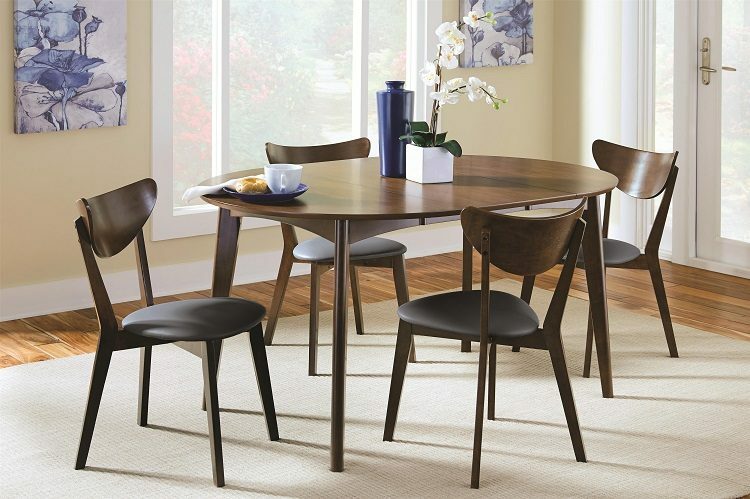 For example, mid century dining chairs from timber and leather can bring some contemporary feel in the midst of a Scandinavian designed dining room. The beautiful texture of the chairs defined by their natural colour can enhance the warm ambience and open the room even more. A beautiful oak dining table in the natural American oak colour along with mid century dining chairs is a perfect combination offering style, comfort and functionality at the same time. Another important component is lighting, lots of lighting. As previously mentioned, natural light is incorporated as much as possible, but adding extra artificial lighting makes for an even better effect. You can consider adding soft sculptural lighting which can add soft pools of light and illuminate the entire workspace. Brass pendants can be a more compatible choice if you’re going for a glamorous finish as to complement the wooden furniture. Also, black pendant lights are very popular as they create a beautiful contrast against the monochrome details. Finally, you can also add some wall art. Depending on your preferences, you can opt for a large canvas or just a simple frame with a monochrome image. The result is a room with a character without trying too hard.